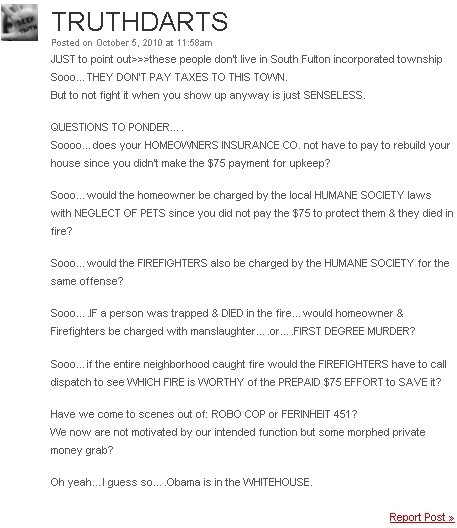 I am sure by now almost everyone is aware of the story involving firefighters in Obion County who did not save a home because the owners did not pay their annual service charges, but what I found interesting was not the story but the response from readers on conservative websites, such as Glenn Beck's The Blaze. The story involved a homeowner operating under the false impression that if he did not pay his service fee the fire department would still work for him. 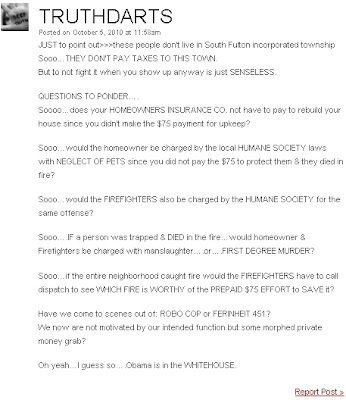 To put it bluntly, the homeowner didn't pay for insurance and suffered the consequences. 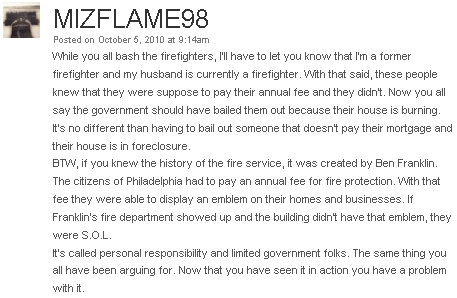 I would like to point out that there were many comments on The Blaze criticizing the homeowner for not purchasing the fire insurance, but I thought the comments attacking liberals were far more interesting because it shows an ignorance of the issue at hand. These people would most certainly be opposed to the health care reform that was passed earlier this year - can you imagine their response to a family having the option to purchase health insurance, only to turn it down and get sick? I'm curious what they would say if the house was a Mosque.